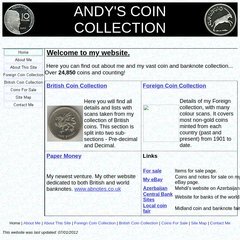 Topics: British Coin Collection, Foreign Coin Collection, Paper Money, Or Sale, Azerbaijan, and Central Bank Sites. coinfairs.co.uk Coin, Banknote, Medal and Antiquity dealers from the UK and Ireland. It has 2 DNS records, ns45.1and1.co.uk, and ns46.1and1.co.uk. 1 1 Internet Ag Baden-wurttemberg is the location of the Microsoft-IIS/6 server. It is written for ASP.NET language. PING www. (82.165.62.149) 56(84) bytes of data.